third parties like your company. 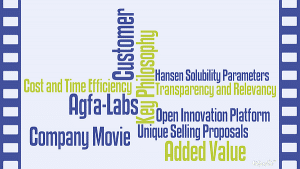 Agfa-Labs was founded in 2010 and has been growing ever since. That’s no wonder. Even though we are a young division, we are relying on 150 years of R&D experience. Our name says it all: we are the Agfa laboratories. 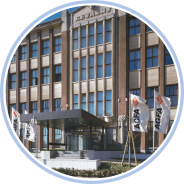 These labs have helped establish Agfa as a house of quality and trustworthiness. An interview explaining the key philosophy of our open innovation platform, our biggest assets, and our unique selling proposals. Mixed with parts of our lecture on “Hansen Solubility Parameters”. Have a look at this short company movie (3 min) made at the Materials 2017 trade show. Agfa-Labs grants you access to more than a century of experience with innovative product development. Our specialty? Organic formulations and coatings in different material contexts. Our biggest assets? A multidisciplinary approach by highly trained staff in well-equipped labs. Several bright employees look forward to tackling your complex challenge with an industrial mindset. This means that your goals always come first. Together, we determine the best way to collaborate. Sometimes, all you need is one-time assistance for a specific request. In other situations, a joint project from a to z leads to the biggest mutual returns. Whatever the approach, Agfa-Labs always stands for cost and time efficiency, transparency and relevancy. The result is added value across your entire value chain. Give us a try and expand your reach! © 2018 Agfa-Gevaert Group. All rights reserved. Last updated on : 19/07/2017.